We welcome the new legislation for stricter environmental regulations. Over the next years, thousands of ships worldwide will need new equipment to meet the latest IMO emissions regulations. We at Yara Marine Technologies can solve the marine sector's environmental requirements with our energy efficient solutions that have proven to work with great success. Would you like to contribute to reduce environmental impact and promote a cleaner global environment? Over the last year Yara Marine has had a substantial expansion and as a result, we are looking for an IT-manager. As IT manager, you will be a key function for Yara Marine Technologies IT business with a focus on ERP systems. You will work close to the organization in a business-oriented manner and will be involved in building up the unit as it is a new function in the organization. Today, the department consists of 2 further employees who focus on system development. You will be responsible for operations and management and create the right conditions for a good IT environment. Have overall responsibility for the company's IT environment and budget. Be responsible for agreements and communication with suppliers. Be operationally involved in systems and integration and development ahead. Educate the organization in updates. Work strategically in projects with new investments within the area. A minimum of 5 years of experience of similar work where you have been responsible for IT strategy and development plans. Educational background within IT or equivalent. Experience of project management for implementation and integration of business systems. Experience of working close to suppliers. Very good knowledge of English in speech and writing. As a person you are structured, self-going and a good communicator. In order to succeed in the role and in order to lead the work, you need to have a good ability to understand the needs of the business and good ability to interact with other units. You enjoy working operationally and can support with simple IT problems from the employees and act as a bridge to external suppliers. Furthermore, you enjoy a dynamic environment where you have the opportunity to create and build an IT department. You are comfortable with making decisions and taking your own initiatives to lead the work forward. We offer an opportunity to be part of a market leading innovative global company in front of green technology for ships, with strong growth. An open and inspiring environment where your energy will make a difference. We provide great potential for personal and professional development. For more information about the position, contact Maria Ahlén 0708-49 02 88 at Intenso Teknikrekrytering AB. Let's make the world a greener place! We welcome your application as soon as possible, selection is done continuously. Yara Marine Technologies develops innovative and high performance systems in environmental engineering for the shipping industry. Founded in 2010, the company has extensive experience in the marine industry through its owners and employees. 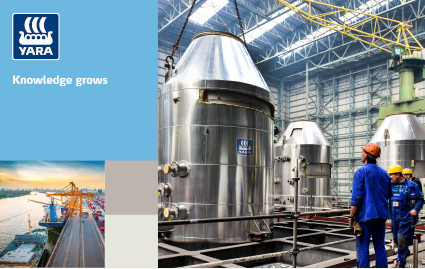 Yara Marine Technologies mission is to develop solutions for exhaust gas cleaning and energy saving that not only benefits the environment, but also creates significant financial savings for the company's customers. The company is today one of the leading suppliers of marine gas treatment systems. Read more at www.yaramarine.com. Sökord: IT-manager, IT-ansvarig, IT-chef, IT-projektledare, ERP, affärssystem, SAP.